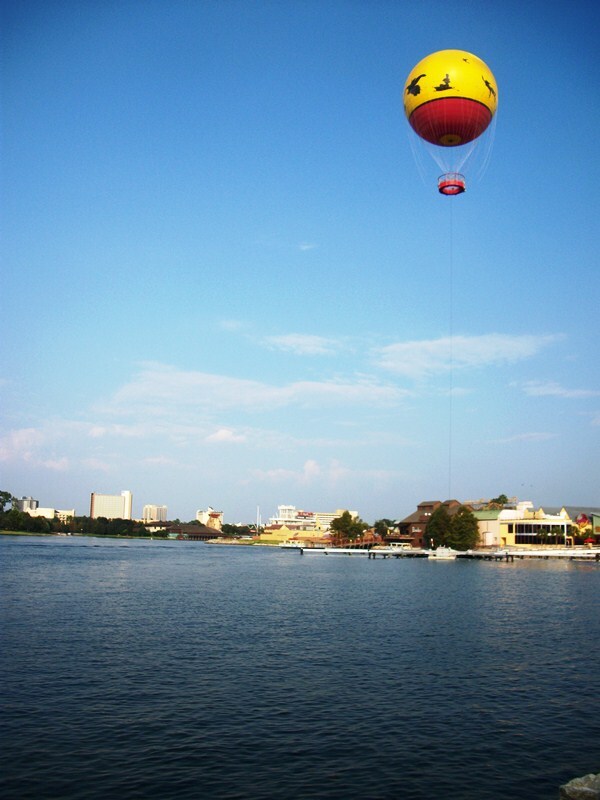 In April of 2009 a new attraction premiered at Downtown Disney, the Characters in Flight tethered balloon. For a relatively modest rate, guests were able to take flight and view Walt Disney World from the elusive perspective of the bird’s eye view. It has been a busy holiday week, but I am sure most of you are aware that the balloon has been missing from the shoreline of Downtown Disney since this past weekend. Due to an incident with a similar balloon experience in Hong Kong, Aerophile, the company which operates the balloons worldwide, decided to ground all balloons for inspection. Given the nature of the Hong Kong episode, where the balloon sprung a large leak and injured participants, though none seriously, this seems only prudent. It was also announced that the balloon at Walt Disney World was due to be replaced in November, and therefore the replacement balloon would be the one returning to Downtown Disney at an as-yet-undetermined date rather than reinflating the current model. Walt Disney World’s website has pulled the page dedicated to Characters in Flight and has made no comment on its removal, allowing Aerophile to be the face of the news instead. With a transition set for an unknown length of time, perhaps now is the perfect time to weigh the pros and cons of such an experience in Walt Disney World. When the attraction first opened, I was a mix of emotions. Part of me couldn’t wait to get up there and take some photographs, and was disheartened when Characters in Flight was closed for wind conditions on my first three attempts. On the other side, the disrupted skyline, particularly in World Showcase, did tend to make me cringe. The Characters in Flight balloon can be seen, or at least a portion of it can be seen, from just about anywhere on the waterfront of Downtown Disney’s Marketplace, West Side, and Pleasure Island districts, as well as from Saratoga Springs across Village Lake. It can also be seen in World Showcase, hovering above Norway or China depending upon your vantage point. This is where many guests, myself included, started to take issue with the balloon. It seemed to disrupt the scenery and grand vista World Showcase had struggled hard to create. However, I would like to amend my previous sentiment. Morocco is often used as the standard for World Showcase coexisting with the world beyond its borders. While the Tower of Terror doesn’t perfectly align with the structures of Morocco, it does all it can to not intrude on the pavilion. Morocco is, I am sad to say, the exception to the rule. Looking towards France and the United Kingdom from across World Showcase Lagoon, elements from The Swan, Dolphin, and Beach Club pepper the horizon and shatter the illusions these two pavilions strive to create. Yet, aside from a few grumbles and groans, we go on about our business. While Characters in Flight is not a constant on the skyline, it does actually add a sense of life to Norway and China. We’ve learned from Soarin’ that many of us share a dream of gliding across a landscape that is familiar or foreign to us. That feeling is also shared in the ballooning sequence in Impressions de France. What wouldn’t some of us give to float over the temples, monuments, and lush wildernesses of China or the castles, sea, and small villages of Norway? While this isn’t precisely what is happening about Characters in Flight, it is easy to imagine that this is what we are seeing when the distant balloon rises over the two pavilions. A balloon that, it should be noted, does not hinder the forced perspective elements of the pavilions in flies above. The benefits of such a balloon, however, are incredible. With airspace over Walt Disney World so restricted, this is a cheap and easy way to see the footprint of the parks and resorts, grab a photograph of how impressive a structure Spaceship Earth is towering over the trees around it, and note the vast swaths of wild lands that remain untouched. It may not sound like much, but trust me, from up in Characters in Flight, in is an amazing world to behold! I applaud Aerophile for taking preventive steps ahead of a potential accident. I know there was a problem in Hong Kong, but they took the step of making sure participants worldwide were receiving the best and safest experience possible, even if that means an undetermined amount of closure and lost revenue. I only hope that Characters in Flight returns, and is better than ever!